1) ChartMogul was founded by Nick Franklin, an early Zendesk employee. 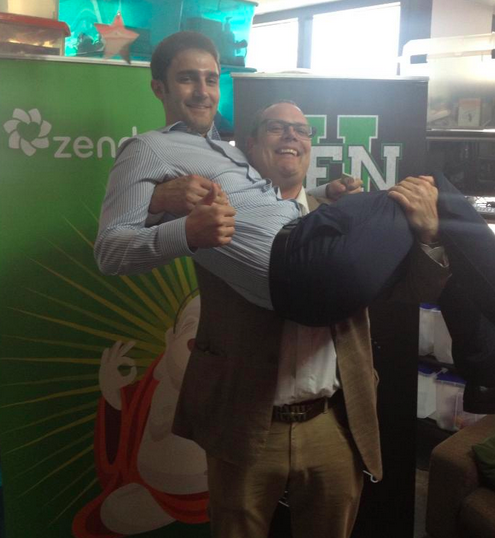 As employee #6, Nick has headed Zendesk’s activities in the EMEA region for two years before leading the company’s expansion into Asia for another (almost) three years. I knew that Nick has done a fantastic job at Zendesk and knew that he was an extremely entrepreneurial, hard-working, well-rounded, smart and nice guy. So when Nick told me a few months ago that he’s leaving Zendesk to start his own startup, I was sad for Zendesk but also very keen on learning more about his new gig. 2) ChartMogul is solving a problem which we at Point Nine know very well. We talk to SaaS startups on a daily basis, and almost all of them either have significant trouble getting comprehensive, accurate and consistent metrics or they had to make huge investments (especially into developer man-months) to get reasonably solid data. When I put together my SaaS metrics dashboard almost two years ago, I drastically underestimated how difficult it is for companies to retrieve all of the relevant data. It sounds very easy in theory, but as we (and many SaaS founders) have painfully learned over the last years, in practice it’s very hard. I’ve heard from several SaaS founders that when they’ve found my SaaS dashboard template, they loved me for creating and open-sourcing the dashboard. But that love turned into hate when they found out, often over months, how hard it is to fill the template with real data. :-) The difficulties include getting and consistently matching data from multiple sources, dealing with complicated billing scenarios, addressing all kinds of exceptions and many more – I’ll let Nick follow-up with an in-depth post on that topic. ChartMogul is solving that pain. You connect ChartMogul with your billing system (Stripe, Braintree, Chargify or Recurly) and at the click of a button, the product will show you almost any SaaS metric that you want to see, including the SaaS KPIs from my dashboard. But ChartMogul is not only a productized version my dashboard template. Since you can slice and dice all the data that you see on the screen, ChartMogul allows you to get many more insights. If you’re a SaaS company, go check it out! 3) We’re convinced that SaaS will continue to grow very fast throughout the decade and beyond, so the company is addressing a large and growing market. What’s more, while ChartMogul is initially focused on B2B SaaS companies, the solution is equally relevant for any kind of business with subscription revenue, which expands the company’s TAM even further. At the beginning of December we had the idea that it would be cool to put together a "recruiting advent calendar" with job openings from within the Point Nine Family. Each day until the 24th of December, we'd showcase one job opportunity from a portfolio company, along with a referral bonus or prize for successful referrals. Our portfolio companies surprised us with some amazing referral prizes. Please take a look at the list below, and if you know any awesome people who might be interested in a career change in 2015, let me know! Referral bonus: One monthly salary of the new employee! Referral bonus: A weekend trip to Berlin! Referral bonus: A round trip flight to anywhere (up to $2,000)! Do you know a VP of Marketing for Gengo? Referral bonus: A trip to Tokyo for 2! Referral bonus: An iPad or iPhone 6+! Referral bonus: A trip to Warsaw! Referral bonus: A weekend in sunny Barcelona! Referral bonus: A Parrot AR.Drone 2.0 Quadcopter! Referral bonus: One year supply of English-grown Earl Grey Tea! Referral bonus: A party weekend in Warsaw for 2!